Competitive intensity is high in the fragmented IoT Platforms market. With more than 450 companies competing for market share, it can be difficult to differentiate offerings from competitors, especially for smaller players. This has resulted in 90% of IoT Platforms generating less than $10M in revenue in 2017. When analyzing marketing messages by IoT Platform vendors, it shows that these are very mixed, with some focusing on the technologies and others on the outcomes. When analyzing the slogans of 20 of the leading IoT Platform vendors, there is no marketing message that clearly stands out to customers. The most often used term is “open”, however, the meaning of this word varies from platform to platform. 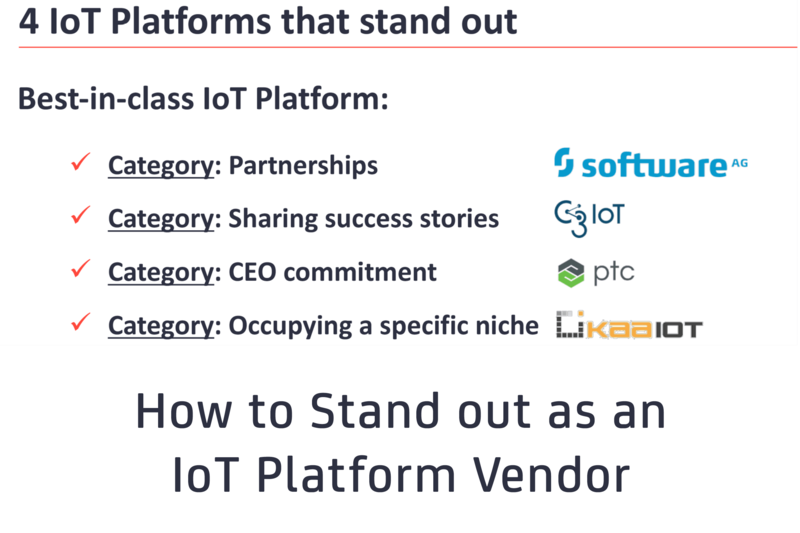 So what can IoT Platform vendors do to stand out? A recent survey and interview series for the IoT Platforms Market Report & Vendor Comparison 2018 revealed 4 actionable insights into how IoT Platform vendors can successfully stand out in the crowded market. 1. Build a strong partner ecosystem by embracing collaboration with 2-3 companies from each layer across the tech stack. To stand out, an IoT Platform vendor should collaborate with a mix of partners from different parts of the technology stack, ideally 2-3 partners per tech layer. Technological: The technological benefit of collaboration is that the IoT platform vendor can focus on their core technological strengths while relying on expertise from others across their non-core activities. This helps achieve new levels of innovation and increase the value generated from using the platform. Partnerships with hardware vendors are most advantageous, as they enable interoperability between platforms and devices. For example, Telit offers its own partner program “Ready for deviceWISE”, providing the possibility of partners to certify their devices accordingly. Business: A strong partner ecosystem also opens up new business opportunities to get involved in some partner’s projects and even start combined-selling of collaborative solutions. System integrators and Cloud backend/IaaS vendors can help bring the platform provider closer to potential users for sales purposes. In many cases, system integrators have dedicated expert teams trained and certified on some of the larger IoT platforms available. Smaller IoT platform vendors can find it hard to approach system integrators unless they bring a customer along with them to run a PoC or pilot project. Thus, it is easier for smaller vendors to find platform sales leads through partnering with a Cloud Vendor, like Microsoft or AWS. For example, Device Wise, which hosts its Platform on Microsoft Azure, also gains many sales leads via Microsoft. 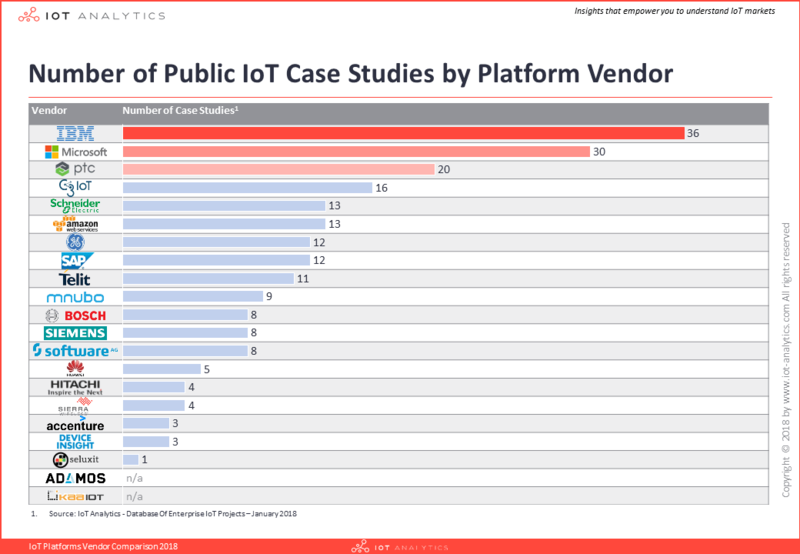 The IoT Platform Vendor comparison shows Software AG, Microsoft, and AWS have the most IoT-related partnerships in place. 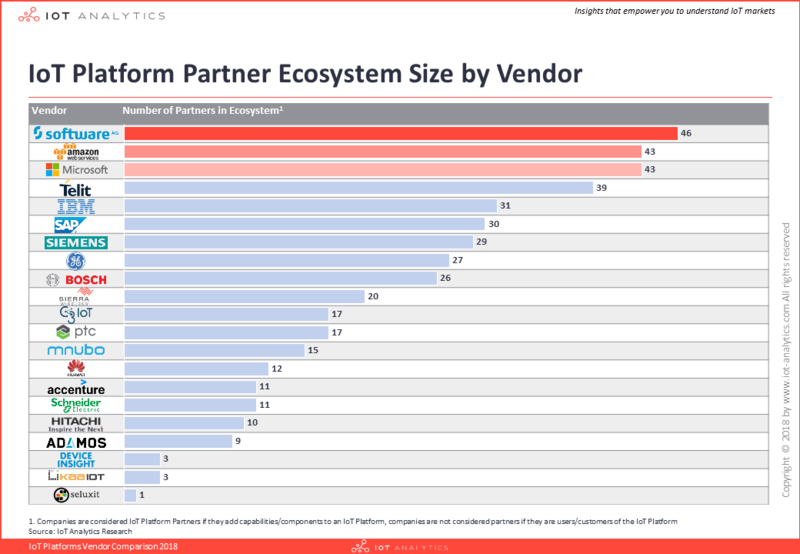 The IoT platform vendors compared in the report on average have 21 partner companies. Software Ag (46 partners), Microsoft (43) and AWS (43) have more than 2x the number of partners which makes them stand out from the rest of the IoT platform vendors. The IoT Platform Cumulocity, which was acquired by Software AG in March 2017 now benefits from the broad partnership ecosystem of Software AG. Since its acquisition Software AG’s Cumulocity has now become one of the top 15 IoT platforms in the market, with the strong partnership ecosystem of Software AG opening many new doors for them in the market. Microsoft and Amazon have also made a big push for their respective collaboration efforts in the last two years and are now reaping the benefits with 90% growth yoy to become the top two leading IoT Platform vendors by market share. IoT platform vendors should be proud of their customer successes and use these to aggressively promote the business. Highlighting case studies based on actual experiences and deployments are the key to credibly promote a platform’s strengths. This information is important for new customers, who want to hear about tangible experiences from using the platform, rather than just marketing information. Successful platforms publicly share customer success stories via their dedicated website, at conferences as well as via direct email / social media marketing campaigns. Some go one step further, by leveraging the partner ecosystem (e.g., an to educate the market in a mutual effort to help people better understand what the platform is and what the benefits of using it are. Several of the analyzed companies still fail to tell existing customer success stories. One of the major IoT platform vendors analyzed, for example, only recently launched a central landing page showing potential customers ways in which the . C3 IoT is a good example of a smaller company effectively using their website for proving their capabilities. They have an online list of public customer stories as well as a newsroom page on which customer related press releases can easily be found. The latter is an easy way of showing off projects that are still ongoing. C3 IoT has a comparably high number of public case studies, which has helped them to secure >$220bn in funding as well as win over big customers like 3M. Having a clear goal and backing from top level management can make or break an IoT platform, especially for larger firms. Top level management needs to be fully aligned on the IoT strategy for the organization and heavily involved in a multi-faceted marketing effort for the platform e.g., regularly speaking on industry panels, performing keynote speeches at tech fairs, giving TV / magazine interviews, and writing relevant thought leadership pieces on the technology. Knowing the leadership team is fully behind the IoT platform strategy builds confidence both internally and externally. It helps employees buy-in to the IoT strategy and objectives of the organization with consistent messaging coming from the top. Customers also view this as a positive factor, as choosing an IoT platform is not easy (or a small investment) and they want to look for a company that is fully behind their platform and still going to be around in a few years down the line. LogMeIn recently sold their Xively platform to Google, as Xively mostly failed to get the strategic integration to existing LogMeIn offerings or the market promotion from leadership required to get the platform off the ground. Companies like Siemens, Bosch, and GE have all made their IoT Platform a core part of their corporate strategy. However, PTC is arguably the stand out platform for going all-in on IoT. PTC’s CEO Jim Heppelman spent over $600M in recent years to build out their Thingworx platform and refocus the entire company on IoT. It is said that PTC doesn’t have the role of the CTO – rather Heppelman occupies that spot as well, creating a direct link between his IoT vision as the CEO and its translation into the organization’s technology strategy. Heppelmann also teamed up with renowned business strategist Michael E. Porter on a 3-part report series for Harvard Business Review on how IoT is transforming competition and companies. He also regularly gives interviews and presents at conferences. This level of commitment and promotion from the highest level has helped PTC become the leading AEP platform on the market with over 600 customers in their IoT business. As much as the first aspect (partner ecosystem) and third aspect (Leadership commitment) are most applicable to large IoT platform vendors, this aspect is rather applicable to small IoT platform vendors. Small vendors have the chance to stand out with an offering that is tailored to one specific customer need, one specific industry or that embraces one specific business model. By doing so, those platforms will likely not appeal to the masses but if done right, it will earn them a spot to pitch their solutions to a small set of highly interested customers. There are various examples of IoT Platform vendors pursuing a niche strategy and thereby standing out. Germany-based Adamos, for example, is targeting machine builders only, promising vertical-specific expertise. Israel-based Axonize at one point had the slogan: “The IoT Platform for System Integrators”. The one company that in our mind stands out the most is KaaIoT. The company has made a name in the scene as one of the few true open-source platforms that makes its source code 100% available to their customers. It particularly appeals to those with limited budget, those looking to avoid vendor lock-in or those with the desire to maintain maximum control over their solution (obviously with certain downsides). The Kaa project initially started as an IoT platform project inside CyberVision, a software engineering and consulting company. After 4 years of development, in 2016, the senior management parted ways and established an independent company, KaaIoT Technologies, focusing on the open source IoT Platform. According to LinkedIn the company has 100+ in-house engineers and is involved in 200+ community projects (where people work together to provide a piece of open source code for the platform ) either completed or currently ongoing. Companies that follow these 4 actionable insights are likely to enjoy success in an emerging market worth billions of dollars. This approach should help companies overcome the $10M revenue hurdle that so far only 10% of companies in the market have passed. Regardless of the strategy, partners, and marketing approach, platforms must not forget that they should first and foremost address the customer needs. Our next article, due out in the coming weeks will focus on the customer perspective. 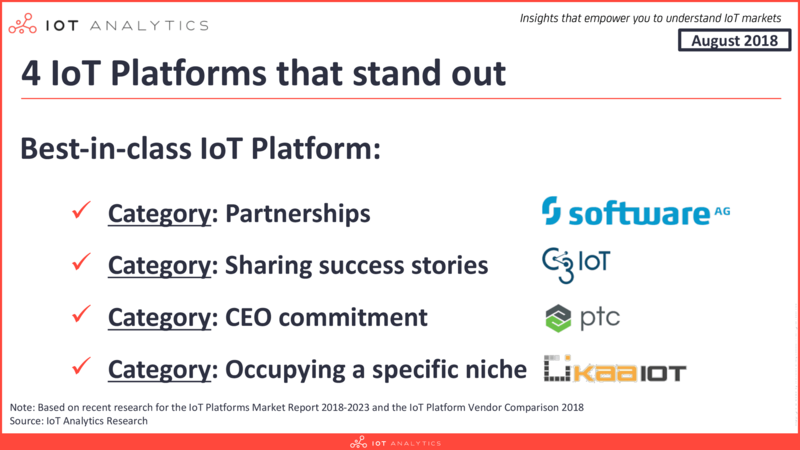 If you want to understand more about the IoT platforms market (e.g., how KaaIoT makes its money, what the Software AG partnership program looks like in detail or what customers say about PTC) check out the IoT Platforms Market Report & Vendor Comparison 2018. These reports offer more in-depth insights on the IoT platforms market and competitive landscape. IoT Analytics has in the past year helped several IoT companies in their go-to-market approach – reach out directly to the author of this article if you are interested to learn more.